My mom's turon is the best. 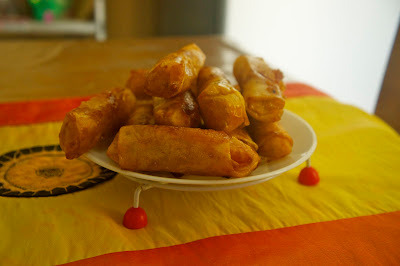 If you search Wikipedia, it's translated to Fried Banana Spring Roll. It is not the same as the Spanish Turron - which is actually a nougat. Among all the afternoon snacks that my mom cooks - this is my favorite. The secret in making really good Banana Turon is in placing a generous amount of sugar inside the banana roll. It should also contain ripe Jackfruit (locally known as Nangka ). And you must dip fry the roll in very low heat. Too much heat and the sugar and the spring roll wrapping burns before the banana is cooked. If you want to add a little bit of western flavor to this snack - serve it with Vanilla Ice Cream. You end up with Banana Turron ala mode.